The resort overlooks the famous Irrawaddy River and covers 24 acres. The gardens are full of trees and tropical flowers and you may catch sight of one of the resident peacocks, the national bird of Burma. 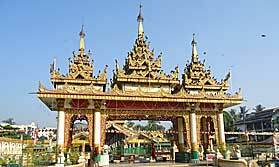 The pagodas of Bagan are a short distance away and the hotel can arrange guided tours of this fascinating site. Cycling, horse riding, village visits and cruises on the river are all popular activities. There are 76 rooms in several categories, all en-suite and decorated in traditional style. Modern touches include air conditioning, satellite TV and minibar. Rooms overlook either the gardens or the river. Dining is a pleasure, with a wide choice of cuisines available. Breakfast is served on the terrace, in the warmth of the morning sun. This area is also used for lunches and later for candlelit dinners while the Pavilion Lounge offers a choice of drinks. The resort has a large open air swimming pool, bounded by a wide deck where you can enjoy the sun. The spa offers massage, facials, body wraps and scrubs, to energise and beautify. There's a boutique selling practical items like sun cream, as well as jewellery, artwork and handicrafts. "Beautiful setting on the river with an amazing swimming pool which was very welcome after a morning of sight-seeing. The bungalows were lovely and very comfortable."